Savurè is an authentic Italian restaurant in Shoreditch, serving some of the best fresh pasta, and finest coffee, for lunch and dinner. Since the first restaurant -which started in Turin in 2013 - Savurè has grown and expanded, with new restaurants in Italy and London. Each of the ingredients used to make the pasta and the sauces is carefully selected and sourced from the best suppliers in Italy. Savurè's mission is to promote and share the real Italian tradition behind one of the most loved foods around the world - Pasta. 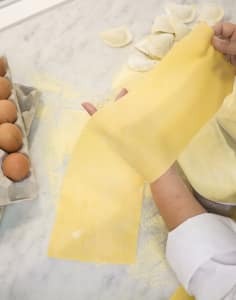 That's why we're so much more than just a restaurant - for example, we host pasta making workshops where we'll share with you just how easy it can be to make healthy and delicious pasta at home. We host classes suitable for any level, and we can accomodate workshops in either English or Italian. Come and join us and you'll learn, have fun, and you'll taste the delicious dishes that we prepared together. Michela was so helpful and knowledgeable, and also made the whole evening really good fun. The venue was bright which was ideal for a calligraphy lesson. We learned the basics with down strokes and up strokes, before going on to write letters. Michela was a really good teacher and gave lots of good one on one time. We got to take the nice pens and practice paper home in little goodie bags that she'd made for us. It was a lovely evening, I would recommend it to any beginner. Really enjoyed the intro and taster into calligraphy. Michaela is incredibly warm and personable, and the small sized class made you feel that you got more of a personalised service. It was certainly a fun way to spend your Friday evening with bubbles and aperitivo as a welcome addition. I'm now in calligraphy practice mode and look forward to perfecting my new craft. We enjoyed a great evening of brush calligraphy accompanied with some prosecco and tasty Italian snacks. The class was everything I wanted and more. Our teacher Michela was very friendly and helped us throughout the class. I had definitely improved after the two hours. The venue was a light, bright Italian restaurant and all the staff were really lovely. I would definitely recommend! I had a one to one class with Michela as the others had cancelled at the last minute. She is just the best teacher, patient and knowledgeable. The venue is great with prosecco and lovely bits to eat ! Altogether a lovely experience, and I have come away addicted to calligraphy ! Teacher was very friendly and helped everyone individually, good to be in a small group (6). Pleasant venue, good light, nice background music, great bruschettas and prosecco! Basic letters and my name I'm slow learner. Great teacher! As a beginner, it was great to learn in a small class with such a helpful teacher. Michela was able to guide us at the different paces that we were learning at and helped us to improve on areas we needed to practice. The venue was fabulous. The teacher was really friendly and informative. Good help on technique and position. Definitely value for money - we not only (genuinely) learnt a lot, but came away with useful resources. The food and drink was also a great bonus. My friends and I all had a fun time doing this workshop. Michela was a brilliant teacher. The atmosphere was very relaxed. No complaints at all! It was a great relaxing evening learning a new skill that I will certainly want to do more of. Michela was very knowledgeable and approachable. She made me feel at ease and explained things clearly showing examples. Very friendly - such a fun class.